Administrator for tennis based at the state tennis centre in Burswood. The site provides tennis information, tournaments, entry forms and local tennis news. 7 Pirate Festival at the Mission San Juan Capistrano Pirates? Tennis information, trivia, and tips about playing tennis. Includes history of tennis, tennis elbow tips, and tennis apparel tips. A local affiliate of Tennis Canada that covers Ottawa and the surrounding area. Local tennis news, tournament schedules, tennis club directory, and information on adult and junior tennis leagues. Non-profit organization dedicated to preserving the history of tennis and encouraging junior tennis development. Find information on the museum, tournaments, calendar, lessons, membership, tennis clubs and links. Link directory of worldwide tournaments, mens and womens professional tennis players , general tennis links, and tennis centers. Provides advice for beginners, tips on tennis elbow treatment, reviews of tennis magazines and books, information on tennis resorts, and recommendations of online stores. Tennis screensavers and PC stuff, freebies, tennisopedia, shop, clubs, news, money leaders, rackets and other gear, PC and video games, calendar, results, 126 tennis stars, 620 players links, tennis elbow, rules, tennis on TV, and betting. Junior residential tennis camp for children 11-17. Tennis instruction and competition and other activities take place on a 38 acre site built as a tennis camp. The US Professional tennis associations youth outreach effort to get American children under the age of 12 to play tennis. Tennis Camp that offers tennis, golf, and academic courses. Provides summer tennis camps and corporate tennis events. Located in Pebble Beach, California. Tennis pro describes non-competitive approach to tennis instruction and offers video and lessons in San Francisco Bay Area. Tennis pro and author Scott Perlstein has created for purchase 18 downloadable tennis lesson videos. Books, hats and t-shirts are also available. A free tennis player matching service designed to match tennis players of all skill levels and all locations throughout the world. The worlds largest tennis museum featuring exhibits, videos and memorabilia of tennis champions, past, present and future. Offers tennis camps and clinics in Bethany Beach, Delaware, and a pro shop with a complete line of tennis equipment and apparel. Features books on the history of tennis and real tennis. Local Pro Andrew Rosz offers tennis instruction and tennis lessons in the South Florida area for all ages and levels. Website also features a tennis tips section. A professional and amateur co-ed tennis league created by Billie Jean King. Membership applications for all levels of players as well as tennis equipment, clothing and other merchandise. If the business hours of Spanish Mosquito: Juan Carlos Ferrero in may vary on holidays like Valentine’s Day, Washington’s Birthday, St. Patrick’s Day, Easter, Easter eve and Mother’s day. We display standard opening hours and price ranges in our profile site. We recommend to check out angelfire.com/ego/spanishmosquito/ for further information. 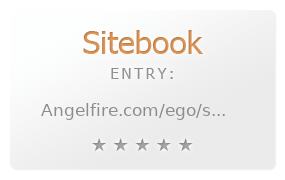 You can also search for Alternatives for angelfire.com/ego/spanishmosquito/ on our Review Site Sitebook.org All trademarks are the property of their respective owners. If we should delete this entry, please send us a short E-Mail.